In a perfect world, the database design for your application would never change. In the real world, most applications grow and acquire new tables, new relationships, new fields, and new features. 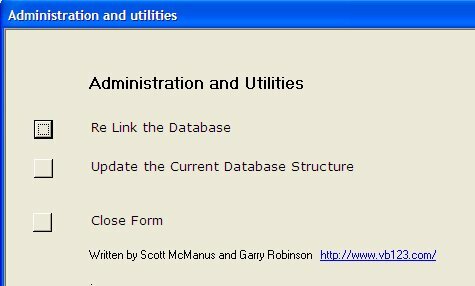 Garry Robinson and Scott McManus show you how they keep the databases for their clients up-to-date and in sync with each other. In the early stages of database modelling and development, the users and the developers can exchange data-only (back-end) databases relatively easily. This tends to happen quite a bit early on while the developer is modifying the structure, relationships, descriptions, data types, and validation rules of the database. However, as time goes on and the number of users and the size of the back-end database increase, it may not be practical to send the data-only database over the Internet as modifications to the data structure are made. Instead, what you need is some way to modify the database design without losing the data that your users have in the tables. This article explores what you can do when you reach this stage in a project. In particular, we describe the software approach that we’ve taken to make these back-end modifications quick, accurate, and painless for all stakeholders. But before we get into that method, we should point out that you don’t always need to implement our solution. The good old-fashioned way to make a small change to the back end is to write down all the steps that the person at the other end must take to implement the change and then e-mail the instructions to the user. This tends to only work for a small number of simple changes. This method can be good enough when all you need is to add a field or change the data description of a field. However, this method does assume that there’s someone at the site who’s capable and willing to make such changes, so, as a developer, you need to be aware of your clients. If you do decide to implement your changes with this method, you’ll always do a better job of explaining the process to your users if you use a screen capture program to capture images of the actual task. Not only does this help give your users a clear idea of what to do, it also provides them with feedback that lets them check whether they’re on the right form and doing the right things. While it’s possible to use the Print Screen button and Windows Paint to create your screenshots, we strongly recommend that you purchase a really good screen capture program like SnagIt from TechSmith.com. Garry uses this program all the time for communicating with our users and developers. Scott uses Corel Draw’s screen capture facility (Peter Vogel, the editor of Smart Access, uses CapturEze, but that product doesn’t seem to be available anymore). There are some real time-savers built into the current crop of screen capture utilities, including the ability to capture just part of the screen, the current window, and the current menu selection. Another option for making complex changes to a back-end database, made possible by the advent of higher speed Internet communications and industrial-strength thin client software such as Citrix or Terminal Server, is to log onto the remote server holding the database and make all the changes yourself. If you’re lucky enough to have a client that’s set up to allow this, all you generally need to do is document all your changes in Word or Excel to ensure that you make all the necessary changes while logged onto the remote session–and don’t make any changes that you didn’t intend. Unfortunately, if your brain is running version 1.0 software that constantly needs to reboot like Garry’s does (Scott seems to have a newer model), we still recommend that you use a professional screen capture program to help document the more complicated changes that you need to perform on the back end. Scott seems to get by with writing notes in a notebook and carefully checking off each step as he makes the changes. In addition to guiding you through the process, these notes and documentation provide an audit trail of what was done to your client’s database. Another option is to build a new version of the data structure in an empty database, then import data from the production database to the new database. This also allows you to create a backup copy of the original database. If you perform these updates on the remote computer, you can send copies of the original and updated database back to your computer for safekeeping. If, on the other hand, you bring the production database over to your computer before making the changes, you just need to rename the original database on the remote computer and send the updated version back to provide a complete set of backups. If you don’t have the ability to log into the server that manages your back-end database and things are getting too complex to explain to the client, it’s time to take the bull by the horns and write some code to make the changes for you. We like this approach because software that updates the back end will help to ensure that the changes will be the same as they appear in your development back end. We’ll call this style of automated update an Updator from now on. Once you send this software to your client, they’ll have what amounts to a two-button solution to the conversion problem, rather than a series of instructions that must be followed precisely. In our situation, we often work on projects where other developers and the DBA are all remote. In this situation, everyone must have exactly the same back-end database, and an Updator ensures that all the people involved have the same structure in the back end. The software also provides documentation of the changes made to the database (sort of an “audit trail in code”). When set up properly, the time taken to apply a large number of updates can be measured in seconds. It also makes rollbacks to previous structures easier when the changes aren’t successfully implemented. Before you get too carried way with writing the software for implementing changes to your client, be aware that the only way to reduce bugs in the Updator is to use the Updator to change your own development database. You first build the program to make the changes, test the program by converting the database at your site, and then send the Updator to the remote sites to have the same change made there (a process known, unappetizingly, as “eating your own dog food”). This methodology also ensures consistency between your version of the back end and the client’s. MsgBox "Data Database Linked OK"
MsgBox "Problem relinking to back-end"
Once we know the location for the back-end database, we then try and connect to the database to test that we can, in fact, open the database exclusively. To do this we use a Workspace object to define a named session for the current user (the Administration user). The Workspace object manages the open database connection and provides, in Microsoft Jet workspaces, secure workgroup support. It’s important that you and your client use a workgroup administration account to change the back-end database. If you’re not using Workgroup Security, this account will simply be the standard user, ADMIN. "users are logged off. If In doubt, use the WorkBench"
'Return reference to default workspace. 'the database in exclusive mode. MsgBox Err.Description, vbInformation, "File Not Found"
vbInformation, "Disk does not exist"
'Opened by one or more people. MsgBox Err.Description, vbInformation, "File Already Open"
MsgBox Err.Description, vbInformation, "File Already Opened Exclusively"
The critical task here is to make sure when setting up the Updator that the Workspace connection to the back-end database has the correct username and password to give you the necessary permissions to update the objects that you’re going to change. Once we’ve written the code to find and open the database, we start thinking about the code to change the structure of the database. To do this, we use a combination of DAO and SQL statements to make the changes–with preference given to using SQL. The portion of the SQL language used to modify table structures is referred to as the Data Definition Language (Table 1 lists SQL’s data definition commands). If you want to read more about these queries and are using Access 97, the easiest way is to search your computer for a file called JETSQL40.CHM or JETSQL35.HL. In that file you’ll find adequate help on all SQL-related topics. You can find this information through the Access Help system, but from Access 2000 onwards it will take some hunting. Table 1. SQL Data Definition Language statements (from Access Help). In our code we like to check to see if the change we’re about to make (in the table, field, or relationship) already exists prior to applying the change. If the change is already present, this is a good indicator that the software has been run before. One final note before looking at typical code for making changes: An important part of developing your Updator application is to build reusable code modules for future use; this also saves you revisiting the sometimes complex processing behind many of the changes. We’ll walk you through some of the modules that we’ve built over the years for performing typical updates. All of our code assumes that our Updator has exclusive access to the back-end database. Adds a new field to an existing table. Adds a lookup table to the database. Adds a combobox to an existing table that’s tied to a lookupdate. Modifies properties for a combobox in a table. 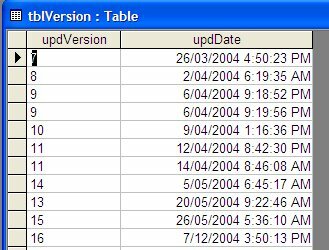 Creates a new relationship between two tables. Updates the version table we keep in each database. lblMessage.Caption = "Lookup table for " & MAINFIELD & " added." & fld & " CHAR(" & intSize & ");"
" in Table: " & tbl & " has already been added : "
MsgBox " Error in subroutine " & Err.Description & "(" & Err.Number & ")"
tbl & " Has already been exported into the BE database." "(" & Err.Number & ")"
Life would be fairly simple if you could make all the necessary changes with SQL, but we frequently need to do things that SQL cannot. In most of these cases we can use DAO to meet our goals. DAO gives us the power to change database properties that aren’t part of the SQL specification (for instance, the properties for lookup comboboxes and validation checks that can be added to fields). In the following examples, we show two functions: one for adding a relationship and one for checking for the presence of the relationship. On other occasions we’ve used DAO for tasks that could have been done with SQL, usually because the DAO version of the code was easier to write in a reusable way. & tbl1 & " and " & tbl2 & " already exists. " & Err.Description & "(" & Err.Number & ")"
Err.Description & "(" & Err.Number & ")"
You may be wondering why we didn’t use the data definition objects that make up the ActiveX Data Objects Extensions library (ADOX)–added to Access as part of the great ADO push in Access 2000. The ADOX library has many useful tools for managing table structures and database properties. However, when we initially tried to use ADOX with Access 2000, we found that ADOX wasn’t always installed on the machines that our clients were using. To solve this problem, we would either have had to build an installer that would put ADOX on our clients’ computers or talk our users through the installation of ADOX. Further, ADOX doesn’t fully replace SQL and DAO functionality, so we would have had to continue to use SQL and DAO in our Updators. As a result, we gave up on ADOX. Since then there’s been minimal further development in ADOX by Microsoft, which makes our decision to not bother with ADOX seem like a good one. With the framework we’ve sketched out here, you can probably build any other routines that you need (and you can look at our sample database for code not included in this article). However, there are some important issues around using the Updator that we should address. For instance, it’s important that maintenance of the database be a scheduled activity that occurs frequently enough to support updating the database. In order for the Updator to do its job, all other users have to be locked out of the database. When maintenance is scheduled and expected, the minimal number of people are disadvantaged when the Updator is run. We use our own tool (called the Access Workbench) to implement regularly scheduled maintenance. Among other features, the Workbench allows us to determine who is on, stop new users from starting a new session, send users messages about the process, and finally shut users down if they don’t log off (usually caused by users who stray away from their machines and don’t see the scheduled warning messages). There are other tools available (principally from FMS) that will meet the same goals. DoCmd.RunSQL "INSERT INTO " & VERTABLE & _ " ( updVersion, updDate ) SELECT " & _ verIn & ", Now() ;"
verIn & ", Now() ;"
In Figure 1, you can see a picture of the records that are inserted by the Updator. As an aside, we also use a table-based versioning system for our Access front ends that uses a similar table. As we’re forever releasing minor updates to all our clients, we’ve further improved this process by building a Version Table Reader into the Access Workbench that we promote to the Access developer community that allows us to quickly see the changes that a database has had applied. Without versioning, we really would be as muddled as Garry’s version 1.00.01 Brain software. Transfer a (lookup) table to the back-end database. Turn a field into a combobox and add a query for its row source property. Add a simple join between the lookup table and the main table. In a production environment, you’d send your users the remoteBEUpdates.mdb database. When you’re using this database, enter a blank password for the Admin account that has been hardwired into the solution. 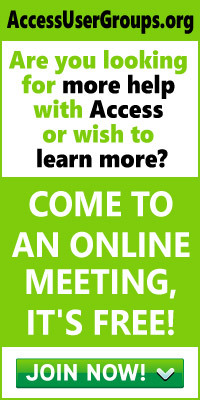 Depending on your Access workgroup installation, you may need to change this. In a perfect world, database developers would design the perfect back-end database the very first time and we’d never have to change the design. Unfortunately, this isn’t the world we live in. In this article we’ve provided you the background to create a solution for the real world: the Updator.